Assorted GARbage» Blog Archive » Thanks, Korea! Hello, Taipei and Hong Kong! Thanks, Korea! Hello, Taipei and Hong Kong! There really are those moments in life, and more specifically in your professional life, when you really, really know why you do what you do. 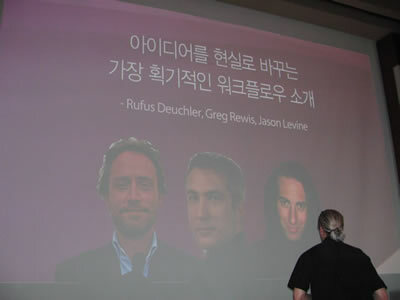 For myself and two members of my team (Rufus Deuchler and Jason Levine), this moment came last week during our seminar stop in Seoul, Korea. Now, for the record, this was my 19th stop in Korea and I have always loved visiting this wonderful country. The people of Korea are some of the most friendly and welcoming people that I have ever met – not to mention that the country is absolutely beautiful, the cities clean, the food fantastic and (of course) the beer top-notch. From the moment I leave, I already begin to look forward to my next visit – and this time was no different. I often tell stories of seminars past that I have had the pleasure to conduct in Korea, of the crowds, the enthusiasm for our products, and the professionalism with which my Korean colleagues arrange and execute them. And, in fact, I had mentioned to Jason several times leading up to the trip that he was in for a real treat – this being his first trip to Korea. Thankfully this time I wouldn’t need to fight jet-lag, as I was coming from Sydney and the WebDU conference – just a mere 12 hours in a plane and I’d be there! The venue was once again the hotel Grand Intercontinental (the site of a very infamous story which will never get told in the blogosphere) – which is definitely on my list of favorite hotels in the world. After a day of preparation with our translators, we were well rested and ready for a day of evangelizing, and our Seoul friends did not disappoint! In fact, Min-Hyoung (our Korean Group Marketing Manager extraordinaire) had treated us to a wonderful Korean BBQ (one of my favorite foods) the night before, where he had expressed serious concern about the fact that they had been forced to close registration at 6000, due to the venue, which could only seat 2500. It’s so funny to see my old picture… pre-ponytail and goatee! Our shout-out to the Adobe Korea team for a job well done! I’ve got a few more pictures in my Flickr stream – along with pictures from our weekend in Beijing for those who are interested. And now, it’s off to Taiwan, and then on to Hong Kong… maybe I’ll see some of you there! Cheers! Have a great trip to Hong Kong! Yesterday, I listened Ur so superb presentation all the day. U love DW so much, but U hate “CSS” until now. I love “Fl” so much, but I really (âˆž times) hate “Fl player” until now. If having no the player in the PC, we won’t see flashes. Therefore, I have to do something for this as telling the reader â€œ U have to download the player â€ or doing interface go instead. Flash let me fell just the same as JAVA do. Java is not Urs problem. However, Flash player is really (âˆž times) Urs problem. I hope that FL CS4 can follow the new concept of DW CS4â€™s. Now, â€œFL CS3â€ is like to be a super-monster — itâ€™s not Shrek, but itâ€™s Hulk. When I was a student nurse or a young nurse, my professor and my senior know the patients are correct forever and ever. Iâ€™ve bought Ur book from AMAZON, but I google out the e-book While I waiting. Now, â€œAdobeâ€ like to be two pregnancy womenâ€¦. Maybe you can bring some new book when you visit Taiwan next times. I want to buy your signature book and take a picture with you. Thanks for ur amazing lecturer in hk!! altho’ the entire dozen of our teammates get up at 6 to take ferry all the way from Macao to take that, we all found it is of great worth & so glad that we were there!! thx so much! actually just encounter 1 problem when using Fireworks to convert jpg for smaller size. we found out that it’s true the size reduce near half & that’s great! bt the color went off, too much red in my case, & VERY obvious. it happens once i open psd in fireworks. is that just becoz of my mis-using? how can we hv reduced size as well as correct color tone in FW w/out the need of toning them there everytime? Orz.. Fantastic show in Singapore yesterday. I definately enjoyed it. Three of you were just amazing. PS: If you guys are working on CS4, could you apply the same shortcuts for all applications? It makes life easier. Cheers! Great blog, but i couldnt understand where can i subscribe to your rss feed? 3000 attendees?? Whats a show man. 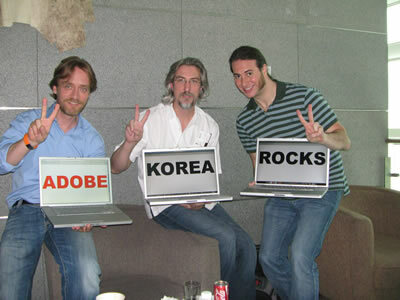 Adobe and Korea both rocks! Thanks Greg for this nice writeup and cool pictures.